To overcome all these problems, the concept of collaborative spaces has come into the picture. Their aim is to free start-ups, SMEs and corporate from the burden of acquiring office space and providing essential services to ensure a smooth experience for employees. The real estate market does not provide ready-to-occupy offices. Setting up one’s own office space is a long and arduous process involving paperwork, long waits for permissions followed by time and effort spent in planning and setting up the required infrastructure. Thus, the demand for such spaces is on the rise. They give capex-free solutions to all these organisations and start-ups. Working from a co-working space has huge financial benefits. The burden of rent, amenities such as wifi etc., is shared among many people making it much more cost effective for a solo worker. Apart from this, these spaces provide a common networking platform. Awfis has a fully-enabled technology platform for making just-in-time reservations at any minute. Awfis locations can be booked directly from the website or through their freely available mobile application available across all platforms. They have a well-established network of 25-30 partnerships and associations with various industries– technology, insurance, food, entertainment, etc. providing benefits to Awfis as well as their community members. They are committed to putting together a healthy mix of fun events and knowledge-sharing sessions. When creating a space, amenities are not the only things that need to be considered. A space must be welcoming, comfortable and lively. It is the duty of the designers to create a space that will not only enhance the productivity of individuals but also provide them with a comfortable and fun work environment. Not every office space is the same, but it is unique in its own way. They all offer different features and diverse ambiences depending on their theme. Similarly, “Nelson, a sister company of Awfis, is our design partner. Their designs include open cabins, conference rooms, cafes, rock pods, meeting pods, lounges, etc. The settings are unique with provisions for diversified work environments. 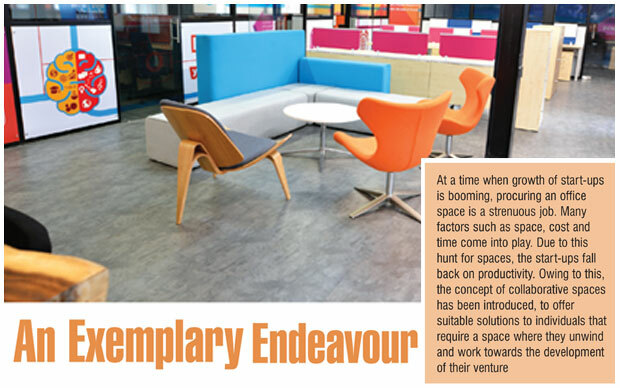 Their philosophy is to design spaces according to the needs of the end user with a thrust on increasing productivity”, said Ramani. Collaborative workspaces offer a productive oasis from being around individuals or groups who have different expertise in varied fields. It means that an individual has the advantages of being with a group of people from diverse backgrounds, who can come together without all the bureaucracy, clutter and alienation that many people may face at their traditional organisations. Increasingly, people are realising that it’s not where one works or what one works on, but who one works with that matters most. For that reason, creating a surrounding that allows employees to connect with more of the people that they work with strengthens culture, boosts morale and increases creativity.